What if Andre Turay had been in the race? Roughly a month earlier, at New Balance Nationals Indoor in New York City on March 10, the Bullis School (MD) senior glided into the semifinals of the 60 meter hurdle championship with his opening effort of 7.74 seconds in the preliminaries, the second fastest time in the early rounds. But when the round returned, Turay never lined up at his block -- perhaps due to an injury -- and later, as favorite Kurt Powdar came up short in the finals, St. Augustine Prep (NJ) prep Sincere Rhea flew to the line in flawless fashion to win his first national title. Would it have been a race? That's the kind of question that doesn't always get answered, but at least on Saturday it will. Rhea, a Penn State recruit, will travel to Potomac, Maryland, to face off against Turay, a Texas A & M signee, at the Bullis Bulldog Invitational in a mano-a-mano matchup in the 110 meter hurdles. It's fair to say that both athletes remain capable of winning a national title this outdoor season. Historically, they've been nearly identical in credentials and resume, with times and accomplishments adding up. In 2018, Rhea was a New Jersey Group champion, a runner-up at the Meet of Champions and fourth at New Balance Nationals Outdoor. Turay won his Maryland County Championships, the Maryland State Title and was third at New Balance. The likelihood is that, beyond a rugged competition at 110mH, both will register their first times under 14 seconds in 2019. Turay opened his season at the Arcadia Invitational on April 6 with a US No. 4 wind-legal time of 14.05 seconds. Rhea has yet to appear outdoors in the 110s. They finished their seasons almost identically, with Delafosse putting down an impressive leap at the VA Showcase with a US No. 7 mark of 19 feet, 10 inches. Harris responded that same meet with a US No. 10 of 19-8.5. 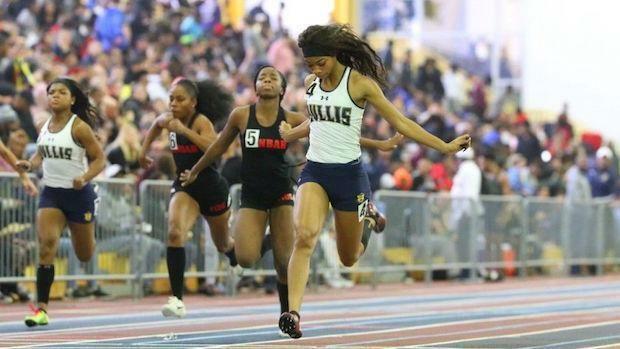 Holman, a junior at Georgetown Day School (DC), broke out in a big way over the indoor season, putting down a US No. 3 time of 1:13.74 in the 500m in February at DC's Indoor Track and Field Championships. Recently, Holman ran 54.96 in April in the 400m. Expect fast times here. The TC Williams senior threw down a career best time of 10.55 seconds at this same meet last year before going on to score a Virginia Group 5A/6A State Championships in 10.70 seconds a few months later in June. He's back for another go-around. It's fair to wonder just how fast Phillips can go in the 400s. She went head-to-head against Anna Hall in the 300mH at the Arcadia Invitational last weekend, winning in a new US No. 1 time of 40.82 seconds. She broke 60 seconds three times in 2018.